Part A demonstrates using the data rate metric for automatically setting up routes. Part B demonstrates instructing the configurator not to use a link when setting up routes, by manually specifying a high link cost. 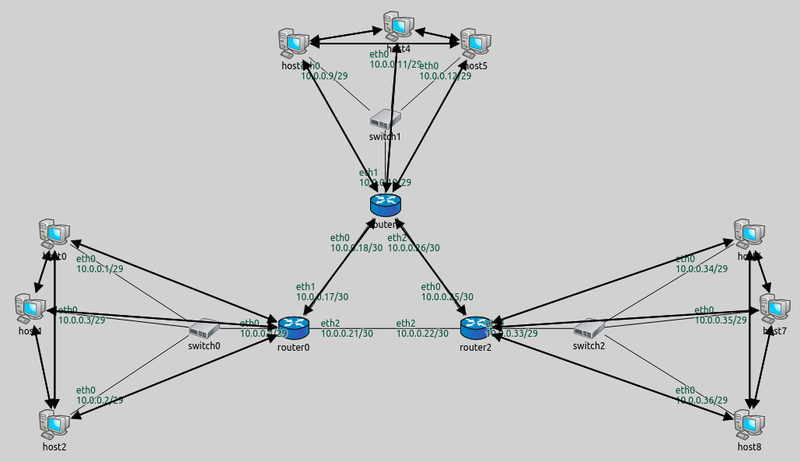 When setting up routes, the configurator first builds a graph representing the network topology. A vertex in the graph represents a network node along with all of its interfaces. An edge represents a wired or wireless connection between two network interfaces. When building the network topology, wireless nodes are considered to be connected to all other wireless nodes in the same wireless network. After the graph is built, the configurator assigns weights to vertices and edges according to the configured metric. Vertices that represent network nodes with IP forwarding turned off have infinite weight, all others have 0. Finally, the shortest path algorithm is used to determine the routes based on the assigned weights. hopCount: routes are optimized for hop count. All edges have a cost of 1. This is the default metric. dataRate: routes prefer connections with higher bandwidth. Edge costs are inversely proportional to the data rate of the connection. delay: routes are optimized for lower delay. Edge costs are proportional to the delay of the connection. errorRate: routes are optimized for smaller error rate. Edge costs are proportional to the error rate of the connection. This is mostly useful for wireless networks because the error rate of wired connections is usually negligible. description = "Setting different metric for automatic routing table configuration - using dataRate metric"
The XML configuration contains the default rule for IP address assignment, and an <autoroute> element that configures the metric to be used. The <autoroute> element specifies parameters for automatic static routing table configuration. If no <autoroute> element is specified, the configurator assumes a default that affects all routing tables in the network, and computes shortest paths to all interfaces according to the hop count metric. The <autoroute> element can contain the following attributes: - sourceHosts: Selector attribute that selects which hosts’ routing tables should be modified. The default value is "**". - destinationInterfaces: Parameter attribute that selects destination interfaces for which the shortest paths will be calculated. The default value is "**". - metric: Parameter attribute that sets the metric to be used when calculating shortest paths. The default value is "hopCount". There are sub-elements available in <autoroute>, which will be discussed in Part B. Here the <autoroute> element specifies that routes should be added to the routing table of each host and the metric should be dataRate. The configurator assigns weights to the graph’s edges that are inversely proportional to the data rate of the network links. This way route generation will favor routes with higher data rates. 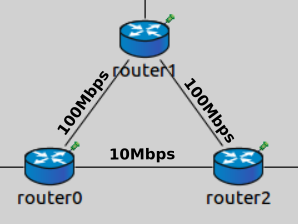 Note that router0 and router2 are connected with a 10 Mbit/s ethernet cable, while router1 connects to the other routers with 100 Mbit/s ethernet cables. Since routes are optimized for data rate, packets from router0 to router2 will go via router1 because this path has higher bandwidth. The first two rules describe reaching router1 and hosts 0–2 directly. The last rule specifies that traffic to any other destination should be routed towards router1. The following video shows host1 pinging host7 and host0 pinging host6. Routes towards host1 are visualized. The packets don’t use the link between router0 and router2. 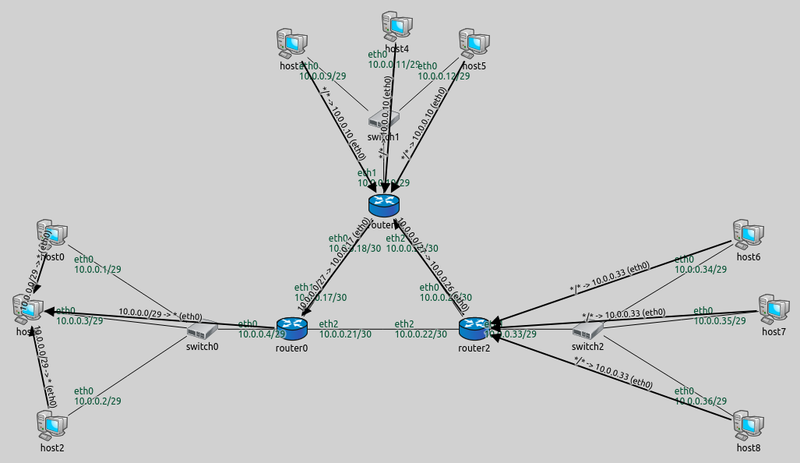 This part configures the same routes as Part A, where routes between router0 and router2 lead through router1. The configurator is instructed not to use the link between router0 and router2 when setting up routes, by specifying the cost of the link to be infinite. 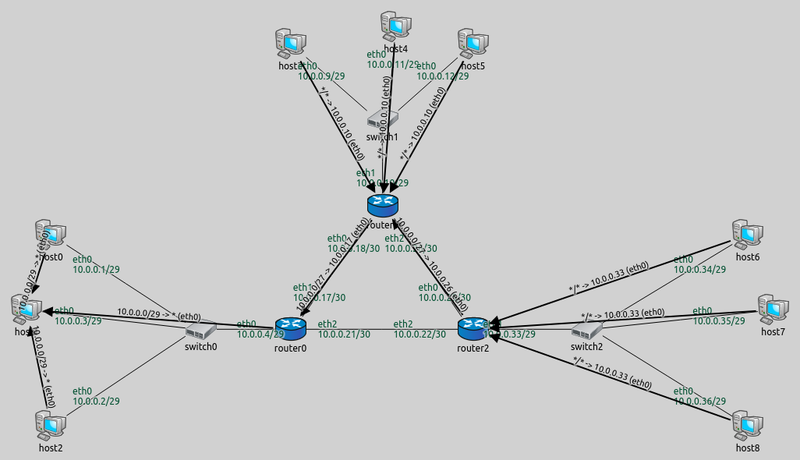 description = "Setting different metric for automatic routing table configuration - manually specifying link cost"
The <autoroute> elements can also contain the following optional sub-elements, which can be used to specify costs in the graph: - <node>: Specifies cost parameters to network nodes. The hosts selector attribute selects which hosts are affected, and the cost parameter sets their costs. Both attributes are mandatory. - <link>: Specifies cost parameters to network links. The interfaces selector attribute selects which links are affected, by specifying an interface they belong to. The cost parameter sets the cost. Both attributes are mandatory. This XML configuration specifies the metric to be hop count, and sets the cost of router0’s eth2 interface to infinite. This affects the link between router0 and router2 - no routes should go through it.